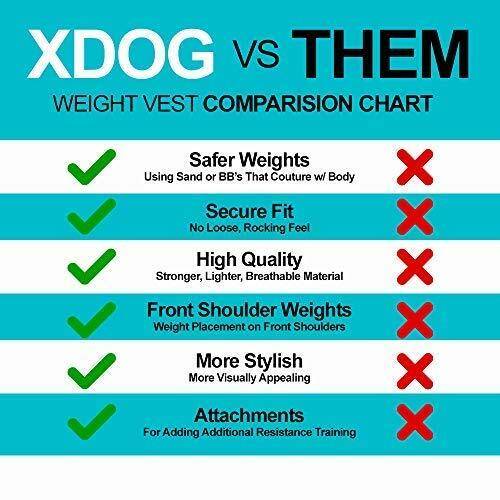 Xdog Weight & Fitness Vest for Dogs - A Weighted Dog Vest Used to Build Muscle, Improve Performance, Combat Obesity & Anxiety - Improve Your Dog's Overall Health & Exercise. The XDOG Weight Vest is a revolutionary fitness vest that can help improve your dog's overall health, and reduce the risk of health related issues due to being overweight. This innovative designed vest can elevate any dog's current fitness, and health levels. 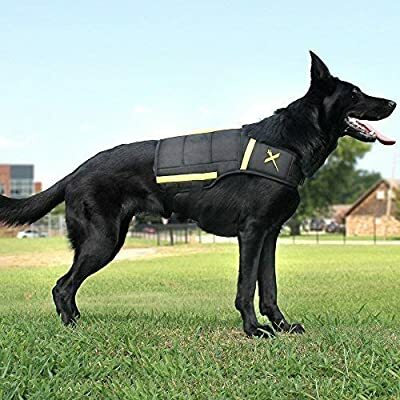 Whether you are looking to improve your dog's performance abilities or just wanting to get your dog in better shape, this vest can assist you with that goal. In addition, the XDOG Vest can help calm or reduce anxiety in stressful situations such as car rides, thunderstorms, or separation to support mental health. 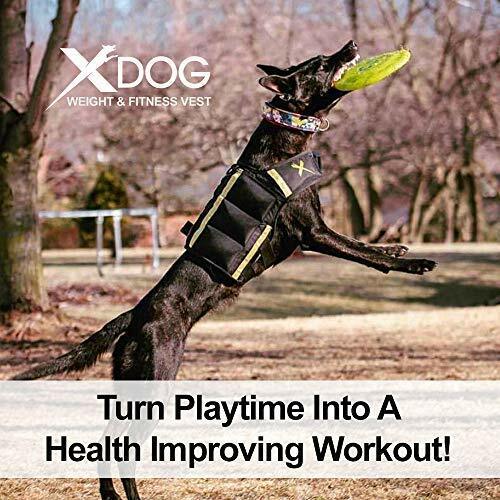 Turn the average walk around the block or playtime into a health improving workout with the XDOG VEST! Are you looking the best dog weight vest on the market? Checkout the XDOG weight vest. Designed to help all breeds improve workout and health. The XDOG Vest also targets dogs with anxiety and helps with calming. The vest is designed to increase resistance during work out by adding weight to your dog. Our vest uses sand filled weights vs metal dangerous weights. Much safer and more comfortable then metal. Less prone to injury and way less discomfort. If your looking for a cheap dog weight vest, this isn't for you. The XDOG vest is the best rated vest on Amazon. It also works well with a dog harness for additional resistance for muscle building. The XDOG vest is great for: walking, training, stress, weight loss, muscle gain and more! 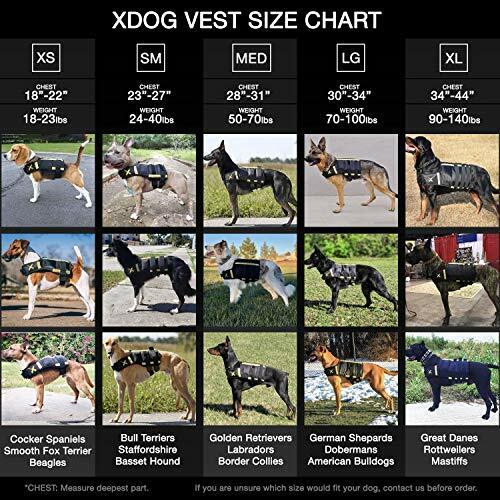 XDOG weight vest is designed for all breeds and sizes. Rottweilers, pitbulls, Labradors, German Shepherds, Boxers, American Bulldog, American Bully, Dobermans, Whippets, Border Collie, Benign Malinois, working dog and much more. Also a great k9 weight vest. Check out our reviews. Looking for more resistance training? The XDOG also features attachment that you can connect to the vest. The parachute, drag bag and resistance band. The best rated canine weighted vest. High quality, light weight material, easy to clean and flexible. Includes free sand bags. The XDOG Weight and Fitness Vest  is a health improving vest that helps with building strength, performance, muscle growth, power, speed and overall health in your  dog. 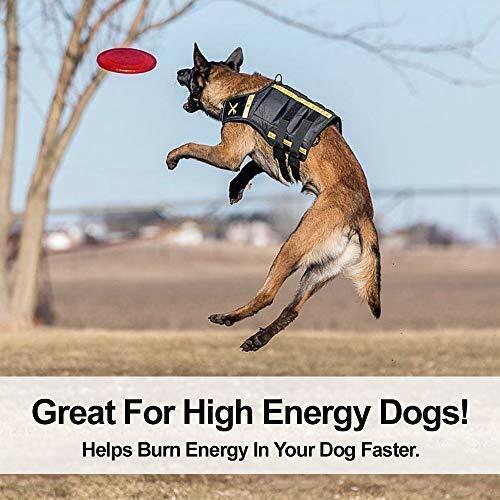 It's also a great tool to help combat obesity in over weight dogs, improve cardiovascular health and reduce energy faster for high-energized dogs. ? SAFE, COMFORTABLE WEIGHTS BAGS - THE XDOG vest uses weight bags that can be filled with sand or copper bb's.These weights are much SAFER vs METAL BAR WEIGHTS that others use because ours can MOLD and COUTURE with the body during movement. They don't cause pressure points and are less DANGEROUS than a heavy bar weight. HIGH-QUALITY, LIGHTWEIGHT, BREATHABLE MATERIAL - The XDOG Vest is built for  durability during workout however its material is lightweight and doesn't weigh down your dog allowing a natural, fluid movement during wear. The vest is also water-proof. SECURE SNUG,  COMFORTABLE FIT - Because the XDOG features both alligator clips and velcro to help secure the vest on your dog's body you won't need to worry about any "side to side" or "rocking" movement of the vest especially during high-intent running or exercise. The vest will securely stay in place 100% and and will NOT interfere with your dog's natural movement. FRONT SHOULDER ? WEIGHT PLACEMENT - The XDOG Vest is the only vest on the market today that features front shoulder weight placement allowing them to build stronger muscles and strength on the front legs for improving explosive takeoff and speed. Don't expect to see this feature on other dog weight vests. Many of them have ignored the front legs completely with weight placement only placed on the back.